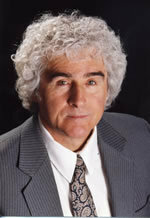 Danny Sheehan, J.D. is an attorney, activist, and defender of social justice. With his wife, Sara Nelson, Sheehan co-founded and co-directed the Christic Institute, a public interest law firm that surfaced and prosecuted George Bush Sr. and his administration for unconstitutional conduct in the Iran/Contra scandal during the 1980’s. Sheehan was also the Chief Counsel in the famous Karen Silkwood case, which stopped the construction of private nuclear power plants in 1979 and raised public awareness of the hazards of nuclear energy and the need for corporate accountability. Sheehan is currently preparing a Federal Civil Lawsuit against the State of South Dakota for illegally taking thousands of Lakota children and putting them in white institutions and homes. He is the President of the Romero Institute, a non-profit law and policy center that legally challenges systemic injustice, formulates and advocates structural solutions, and maintains the Christic institute Archives. Sheehan is the author of Assault on Nicaragua: the Untold Story of the U.S. ‘Secret War’ and Inside the Shadow of Government: Declaration of Plaintiff’s Counsel Filed by the Christic Institute.